Chillers and Heat Pump Chillers have been increasing in popularity recently. They offer greater energy efficiency along with the ability to expand, or change the system in the future. By using water to cool and heat, you can always add on zones as you see fit. Some customers have used a high velocity system for their main system and then had some individual small room fan coils or an aircell fan coil in select areas, like the master bedroom or the garage. That allows you to only condition the areas you are using. Why cool or heat your entire house at night if you are sleeping in one room. Lots of possibilities to consider when using a water based system. High Velocity Cooling and Heating works great with chilled/heated water. Both Hi-Velocity and SpacePak both have a chilled/heated water option for their high velocity systems. Chilled/heated water also works best for zoning, since coil freeze up won't happen. Using multiple air handlers is also a task beautifully handled by a chilled/heated water system. If the 2, 3, 4 and 5-Ton chillers on this page don't suit your needs, we also work closely with our friends over at AquaProducts and we can get 1.5-Ton to unlimited capacity chillers for your project. Just ask us for help with these if you are interested. 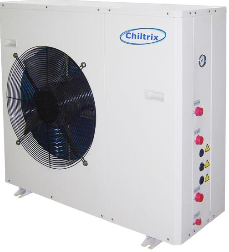 Be sure to check out the brand new Chiltrix inverter variable speed heat pump chiller. It's the only inverter variable speed heat pump chiller available in the market today. It boasts the highest efficiency of any heat pump chiller we have ever sold. If you are using a chiller and/or heated water system, then you can use the popular SpacePak aircell fan coil system, or their high-wall or thin low-wall H2O fan coils, or H2O standard air handler. If those don't suit your needs, we have other options available through FirstCo, Williams and EMI. Just ask us for help.